Randolph Hills was featured in the March/April 2018 edition of Bethesda Magazine as one of “8 Great Affordable Neighborhoods” in the Bethesda-area. The writer of the article recently joined us during the community BBQ/5k last October and had the opportunity to chat with several community residents. It’s that time of year again and your RCA membership is more important than ever before. As we work to continually improve our neighborhood, your $10 membership and continued participation are critical to the success of events like Community Day, programs like the the Welcome Wagon and publications like the Echo. You can pay your membership fees online on the Membership page. Thank you for your support! The September 2017 Echo is is available for download. Due to a lack of volunteers, we regretfully announce that we must put the Community Yard Sale on hiatus and have canceled this Fall’s yard sale. Our community has held a yard sale at Loehmann’s Plaza twice a year for decades. In recent years, the Boy Scouts ran the event, and we are appreciative of their efforts. Over time, we have seen declining participation, particularly from neighborhood residents. In addition, the rise of EBay, CraigsList and Nextdoor, have provided alternative means for selling household goods. Currently, we do not have volunteers available to run the Yard Sale. If you are interested in helping us continue this event, please contact us at Info@randolphcivic.org. Duties include putting up and taking down the banners, advertising the event on craigslist, setting up flag streamers/cones, and collecting booth fees. If new volunteers are not found, we will put the event on hiatus until we can find someone. It is possible that we could reduce to once a year if needed. 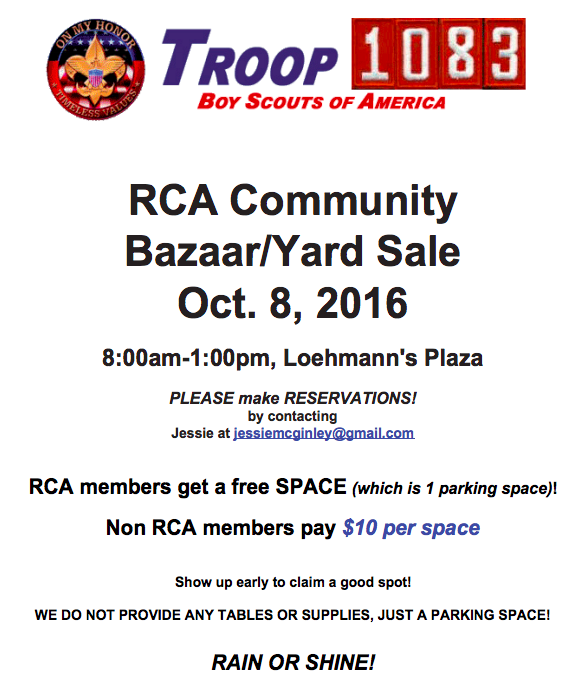 Another possibility is to replace the Loehmann’s event with a neighborhood Yard Sale Day. With this kind of event, we would pick a day to advertise a community-wide yard sale, and residents would just setup wares in their front yards. Signage would be available to direct people to participating homes. This kind of event would require far less volunteer effort. If you would like us to pursue this option, please come to the October Meeting- we will discuss after the District 18 delegation portion. Mark your calendars. Musicfest is happening on Sunday, April 30th starting at 5:30pm at 7 Locks Brewing on Wilkins Avenue. Join your neighbors for live music and great craft beer. The Rolling Brick pizza food truck will be there as well. Admission is free. Children are welcome. Great chance to meet your neighbors. Please join us! The January 2017 Echo is available for download on the Echo page. Includes our testimony before the Planning Board on the White Flint 2 Sector Plan. Join us on Thursday, October 6, 2016, for our first meeting of the year. We’ll have a great guest speaker: Matthew Hawkins, the new acting principal of Viers Mill Elementary. We’ll also probably catch up on White Flint / Pike District news and other items of interest to the community. See you at 8 pm at Veirs Mill Local Park!